Consumers said they planned to spend an average $967 during the 2017 holiday season, according to research from the National Retail Federation and Prosper Insights & Analytics. If you were generous with others this holiday season, they might have been equally generous with you. This means you might have plenty of holiday gifts sitting around — maybe some gifts you don't even want or need. If you have the receipts, by all means, return them. Hopefully, you can get cash in exchange. But even if you can't, you'll probably be able to turn your unwanted gifts into store credit. You can then shop at that store on someone else's dime without dipping into your own wallet. The odds are high that you received gift cards this year. The National Retail Federation estimated that 2017 holiday shoppers each planned to purchase around four gift cards with an average value of $45 per card. You might not want to think about credit card debt right after the holidays, but it's important to not ignore it. Whatever you do, don't only make the minimum required payment. If you do, it can take you years, and cost loads of interest, to pay off that debt. Say you owe $7,000 on a credit card with an interest rate of 18 percent. If you make the 4 percent minimum required payment each month, it will take you 147 months — or more than 12 years — to pay off that debt. You'll also pay a total of more than $11,000 on the card. And that assumes you don't make any additional purchases with it. Of course, you'll struggle to ever pay off your holiday debt if you don't first stop adding to it. Make a resolution to stop using your credit cards to pay for items. Instead, use your debit cards or cash for your purchases. This will require planning, and maybe a bit of sacrifice. You might have to wait to buy that new laptop until you've saved up enough to pay for it in cash. But you'll be thankful as you watch that credit card debt steadily disappear. If you've resolved to pay down your holiday debt, you'll need savings. What if your water heater bursts or your car conks out? If you don't have any money saved up, you'll have to put those repairs on your credit cards, adding more to your debt levels. A better move is to start creating an emergency fund. As the name suggests, an emergency fund is a stash of cash that you stow in a safe place, like a savings account. You withdraw from the fund to cover any unexpected emergencies. 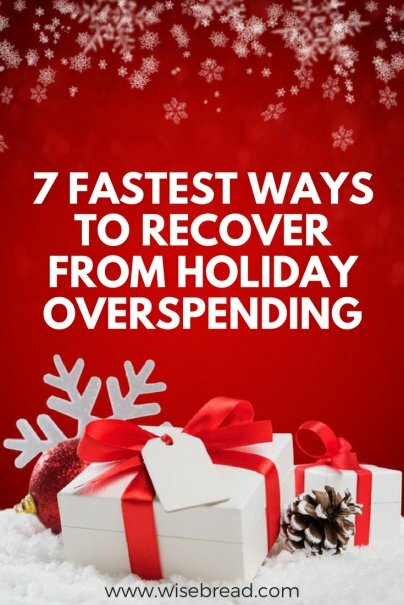 The more money you have to devote to your holiday debt, the better. Start the new year by cutting back on unnecessary expenses. All those trips to restaurants and the movies add up. If you cut down on your discretionary spending, you might have $200 or more extra each month to put toward reducing your holiday debt. Maybe you received plenty of stuff during the holiday season — you might even have too much stuff. If so, sell some of it off, either online or through a yard sale. The extra money you make by selling a Crock-Pot or tablet that you no longer need can bring in some much-needed extra cash that you can use to pay down that mountain of debt.